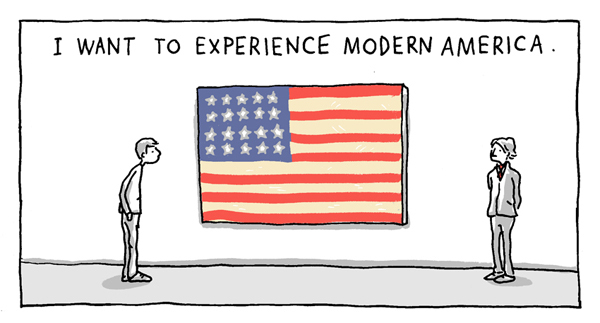 The latest comic in my series "Who Needs Art" is up on Medium.com. It's a reflective stroll through a gallery of 20th-century American art. In other exciting news, a few of my comics were selected to appear in the Best American Comics 2013! It's not available in stores until October, but you can see the cover (by the incomparable Kate Beaton) here. The Hic and Hoc Illustrated Journal of Humor, an outstanding collection of humor comics edited by Lauren Barnett and Nathan Bulmer. Alternative Comics #4, featuring an equally star-studded lineup of cartoonists. The "Nerds for Hire" podcast, where I discuss freelancing as a visual artist with hosts Non Wells and Mindy Holahan. Will it be possible to order a poster of this from your store? I would love to put this on my wall. @Zachary: Yes, it's available - it would be printed on two separate 11x17" sheets. Cost is $15 plus shipping. See my poster shop for details on ordering.